June 22nd, 2008: Bismarck, ND. Sunny, highs in the mid-80s (or 30s in Metric), light winds. No thunderstorms for at least three nights, though lots before that. We left Keystone last Monday after taking one last photo of the train as it went by. We loved the sound of its whistle, always far enough away that it didn’t bother us. The train itself ran very quietly past our campsite, being quite level there, and it only going about ten miles an hour. 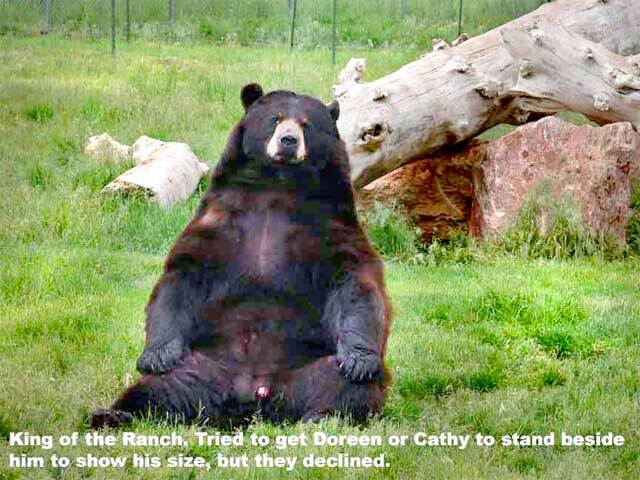 We stopped at Bear Country USA and took the tour. The animals are not confined, and vehicles wander around amongst them. At one gate, it took us about twenty minutes to get through because some reindeer were grazing and napping at the Texas gate. There were a lot of elk, Rocky Mountain sheep, Dall sheep, mountain goats, an arctic wolf and some timber wolves, which we didn’t see. Then there were the bears – dozens of them, black, brown, cinnamon and blond – wandering around loose. We were warned to keep all doors and windows closed, and not to get out of our vehicles. One big, fat old guy just sat by the road looking at people as they went by; another was taking a bath with only his head sticking up out of the water, and another couple were scrapping on the road, holding up traffic. I noticed the Texas gate controlling the bears had a couple of electrified wires running across it as well as the poles. Then there was an area where the animals were penned, as in a zoo, and that is where the grizzlies were. We couldn’t get them to stir. There were a bunch of bear cubs climbing a tree, an otter running back and forth, and a badger pacing his fence. All North American animals. We thought it was worth the fee. We just stopped in Rapid City long enough to gas up and buy some groceries, and then went on to Wall, a small town about fifty miles east of Rapid City famous for its Wall Drug, the biggest conglomeration of souvenirs and tourist gimmicks in the world, I expect, and the gateway to the South Dakota Badlands. We visited Wall Drug a couple of times, mostly admiring its art gallery, where we saw one of Adeline Halvorson’s (formerly of Kuroki, SK) horse portraits hanging. 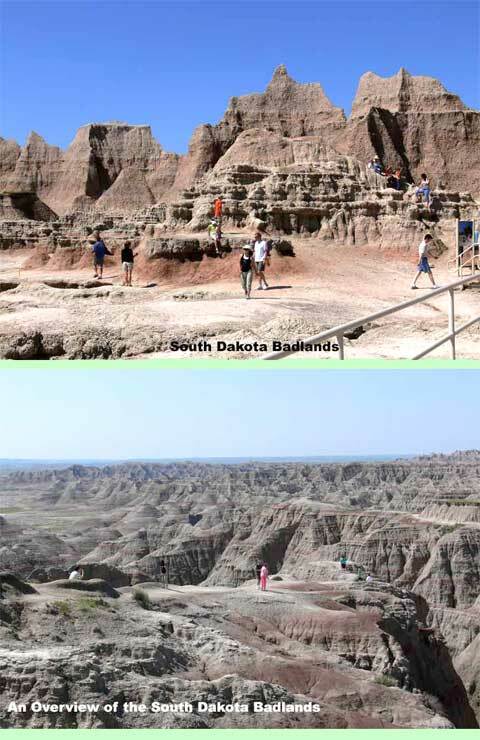 The tour of the South Dakota Badlands was incredible. 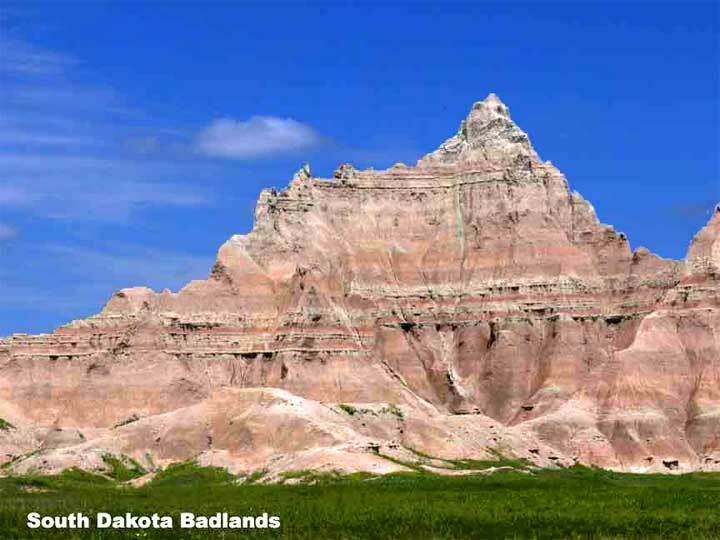 They are totally different from the North Dakota Badlands at Medora, or our Big Muddy Badlands. Parts of them are formed as the sandstone is washed down from the surface, but there was a huge upheaval at one time that left a high, jagged wall, which is where the town got its name. We only spent about three hours driving through, at high noon which is the worst time to view them. We could easily make three more passes through them – early in the morning, late in the evening, and backwards, and they would be completely different. That might be a sensory overload. Highly recommended! Pierre, SD was our next stop. 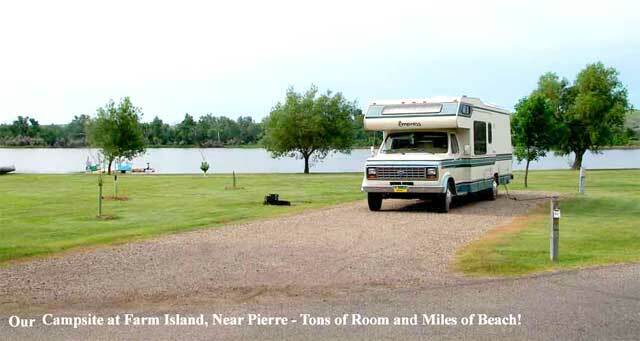 We got a site at Farm Island Park Campground right on Lake Sharpe, which is a backwater of the Missouri, formed when the Missouri was dammed. Lovely, big, wide sites by the water, and the water has a continuous beach that seems to go on for miles. It got over 30° on Wednesday and terribly muggy, so we just closed the blinds, turned on the air conditioning and vegged out. In the morning, a service vehicle went by with a mounted sprayer, spraying the beach. I have no idea what he was spraying for but he obviously wasn’t worried about being seen. We toured the State House next day, a lovely building restored to its 1910 splendor, which was considerable. Beautiful grounds with many sculptures and lovely lawns, and poor Freckles had to be on a leash! There was another sprayer spraying a lawn among some trees, or more like fogging, and we assumed it was for mosquitoes. Right out in broad daylight. People down here must have a different attitude towards public spraying than we do at home. We took off towards Bismarck, taking the Native Scenic Byway up the west side of the Missouri, or Lake Oahe as it is called here. 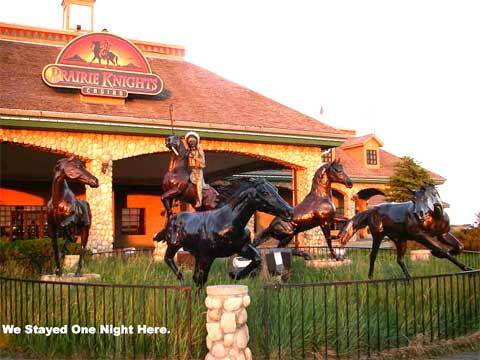 We ran out of time and had to overnight in a dry camp at Eagle Butte, where I got to watch some slo-pitch ball games, and at Prairie Knights Casino, where Doreen scratched her gambling itch. We got a lovely site at the KOA Kampground at Bismarck and have been doing all the usual tourist things, like visiting the Zoo, the Former Governors’ Mansion, and the Heritage Center. Tomorrow, we plan on taking an old trolley ride out to Abraham Lincoln State Park and back, then on Tuesday we will be pointing towards home. Sergeant Adare Guest from the RCMP (Rose Valley detachment) will be in attendance to discuss the recent rash of break-ins at the park and provide information. He will also discuss boat safety and regulations. Also in attendance will be a person from RCMP Victim's Services to discuss our fears/worries on these break-ins. Joe Ottenbreit, Park Supervisor will give us an update on all park happenings.